Significance : Famous for Shri Yellamma Devi Fair. Saundatti is one of the oldest towns in Belgaum district in the Indian state of Karnataka. It is a popular pilgrim and historical destination situated at the foot of the scenic hills known as Sidhachal or Ramagiri overlooking the beautiful river Malaprabha which enhances the richness of the region. Also known as Savadatti, this region is about 112 km from Belagavi. However, Dharward, Belgaum and Hubballi are nearer, at a distance of 38 km, 78 km and 58 km respectively. Saundatti, now the taluk headquarters of Belagavi was the capital of the chieftains called the Rattas. There are several ancient temples in Saudatti but the most famous is the Renuka or Yellamma temple. It is dedicated to Goddess Yellamma, a traditional manifestation of Goddess Shakti. Goddess Yellamma is also known as Goddess Renuka, the consort of the mythical sage Sri Jamadagni and mother of Lord Parasurama, an incarnation of Lord Vishnu. The temple forms the sacred crown of the beautiful Ramalinga Hills about 5 km from Savadatti. It is regarded as a Pithas i.e. one of the 52 places where parts of Sati's body fell when it was servered by the Chakra or the Holy Wheel of Lord Vishnu. The temple was built by Bomappa Naik of Raybag in 1514. There are temples of Lord Ganesh, Mallikarjun, Parshuram, Eknath, Siddeshwar etc in the temple premises.The temple is built in the Chalukyan and Rashtrakuta Style of architecture, but the carvings reflect the Jain architecture. Behind the temple there are sacred tanks known as Kumkum Kundam, Yoni Kundam where devotees take holy dips and perform Pooja. The holy waters of Yoni Kundam is sold in sealed containers. Jogal Bhavi is a sacred well nearby whose holy waters are believed to cure skin diseases. Adjacent to the temple lie the sacred ground known as the Prasurama Kshetra, meaning the Place of Parasurama where Lord Parasuram is said to have meditated. Every day, hundreds of pilgrims visit the temple with great devotion and crowded especially on the full moon day of the Hindu month of Margasira. The full moon day is also known as the Bharat Hunnime. During this time, the congregation in this region crosses ten lakhs. A fair is organized in the honor of Yellamma Devi and it is held about 5 times right through the months of October to February. But the biggest is the one held on the full moon day of Margasira. On this occasion, the goddess Yellamma is worshipped in the manner of Shakti Puja and the famous Neeramanavi Yellamma Jatra taken out. Another interesting practice during this fair is the Devadasi Custom. During this festival girls are given in marriage to the God and become Devadasis or slaves of God. An 18th century fort built by Sirasangi Desai can also be seen here. Besides, there are also other wonderful monuments in Saundatti. The beautifully sculpured sacred reliefs of Lord Ankeshwara, Lord Venkateshwara, Lord Mallikarjuna, Lord Pradeshwara and Lord Veerabhadra are to name a few. Two small Jain Bastis of the Ratta era can also be seen. Between Saundatti and the temple is the magnificent fort of Parashghad, dating back to the 10th century. Built by Shirasangi Desai, the fort was expanded by 'Chatrapathi Shivaji'. This fort has eight bastions and atop the fort is a small ruined shrine Kadasidheshwara temple dedicated to deity Maruthi. 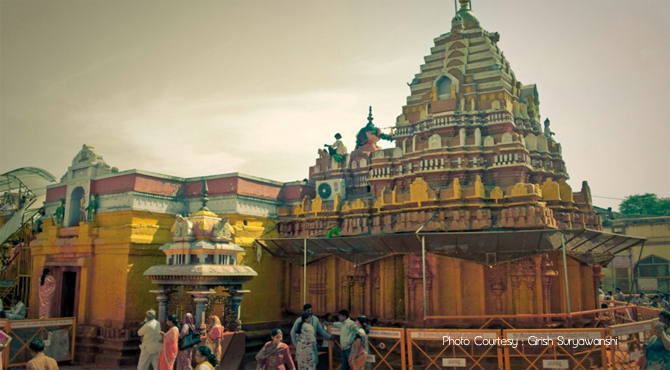 This temple is surrounded by four bastions. The inner chajjas of this temple have rows of carving of geometric patterns with over two hundred designs, some painted.